This is my first post on SCCM Educational post series. I will provide more information about “SCCM Educational post series” in upcoming posts. In case you are a newbie to SCCM then this is the important guidelines for you. The details of SCCM Console nodes or buttons will give you an overall idea UI capabilities. This post will help to learn and understand SCCM in a better way. I always think about a teaching technique which starts from SCCM console. Do you think it would be ok to start SCCM learning with SCCM console overview? 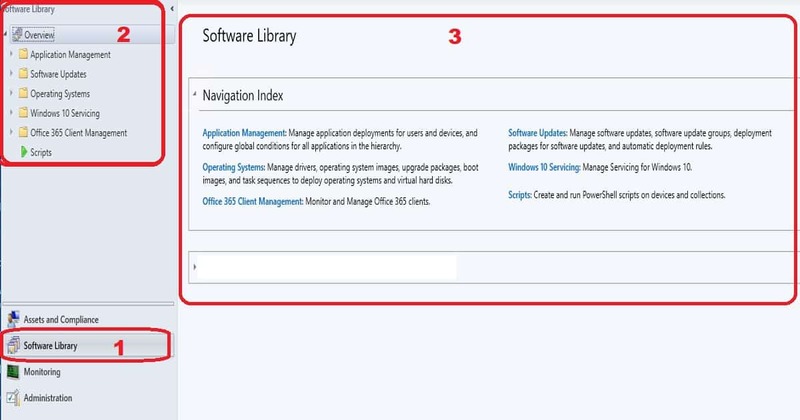 I have also included Audio explanation in the video tutorial about SCCM console overview. How to Launch SCCM Console? How to Connect to SCCM Primary/CAS site with SCCM Console? I have also included Audio explanation in the below video tutorial about SCCM console overview. SCCM console is an administrative tool where an admin can perform a variety of device management, application deployment, network and, server administration tasks. This is the single pane of glass from where SCCM admin can perform Application, Patch, OS deployments and many more administrative functions. The SCCM console uses the common System Center framework for its administrator console (“Microsoft.ConfigurationManagement.exe”), and it no longer relies on an MMC interface used in old versions of SMS 2003 and 2007. Launch ConfigMgr / SCCM console – Click Start | <All Programs> | Microsoft System Center | Configuration Manager Console. For SCCM console logs are located in the following location. The issues with the SCCM / ConfigMgr administrative console can be traced in the SMSAdminUI.log file. Launch SCCM console and click on the drop down Arrow near to Home button. From the drop-down list, you can select “Connect to a New Site” option. Through this “You can connect to a CAS or primary by specifying the FQDN or computer name of the server in that site”. The following terminologies are used in all the Microsoft Docs. So it’s useful to understand each part of SCCM console. 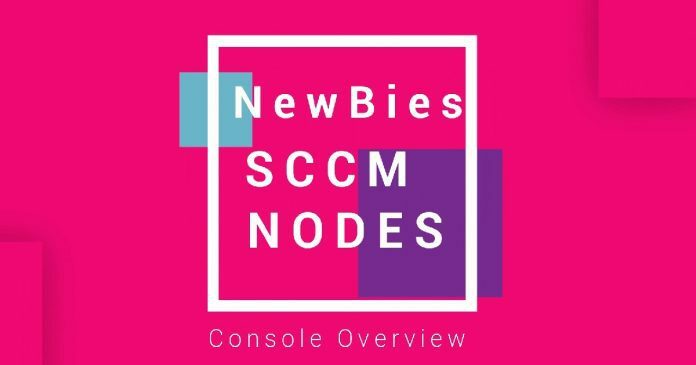 SCCM Console nodes overview will help newbies to understand the console functionalities in a better way. When a workspace is selected, the SCCM Console reflects the workspace accessed. 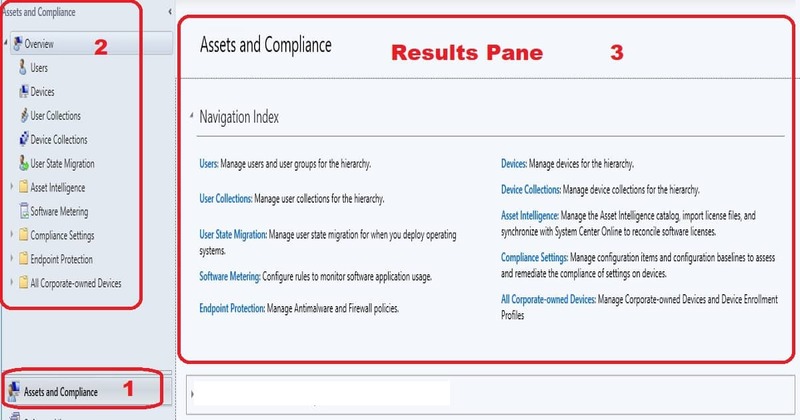 The default workspace selection can be “Asset and Compliance” SCCM Console. Navigate is located above the workspaces in the far left window pane. 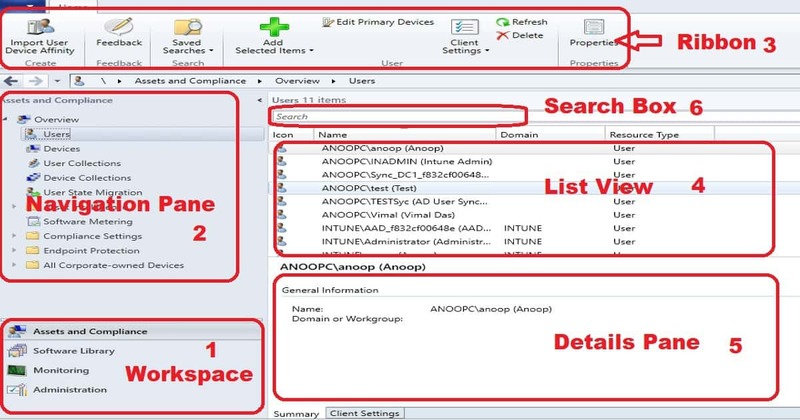 The navigation pane nodes that are displayed are dependent upon the workspace selected. The ribbon is the place in SCCM console where admin cab perform a set of actions or tasks for the selected navigation pane node or list view/ results pane item chosen. Result Pane is the large window pane that appears in the middle of the SCCM Console. The results pane displays objects based on the node or item selected in the navigation pane. The results pane is comprised of a list view, a details pane, and a filter box (see below for more information on these items). List View is the top portion of the results pane and displays items based on the node or object selected in the navigation pane. Details Pane is the bottom portion of the results pane, and when it appears, displays additional details about the object selected in the list view. In this SCCM console nodes overview, I’m going to give a high-level overview of each function underneath four (4) workplaces. 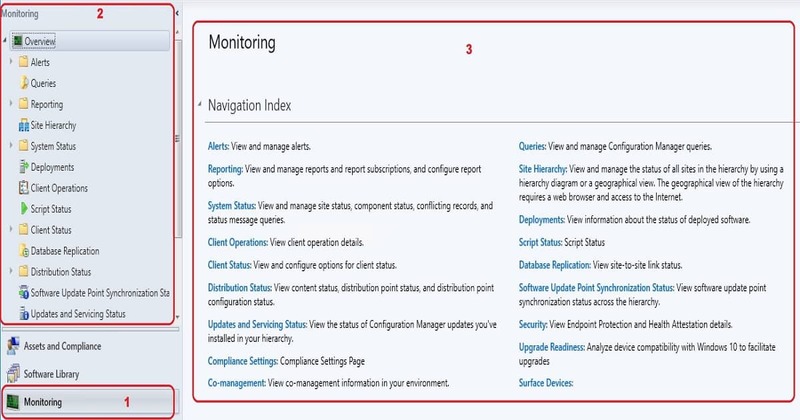 Following are the basic functionalities of Assets and Compliance workspace of SCCM console. Following are the nodes which will help you with admin activities. The “Software library” node is the SCCM console workspace node which manages the software related configuration and deployments. More details available in the below section. Also, find the sub nodes of Software Library Work-Space, and it’s brief description in the following section. 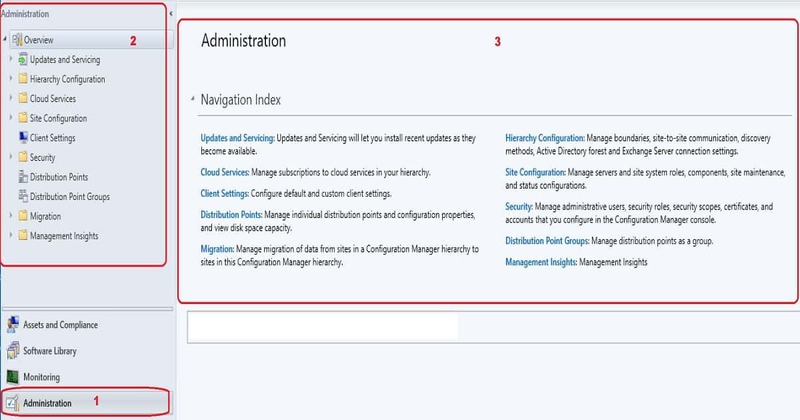 Application management is the place where you can manage application deployments for users and devices, and configure global conditions for all applications in your SCCM environment. Operating System node helps to manage drivers, operating system images, Update packages, boot images, and task sequences to deploy operating systems and virtual hard disks. Office 365 Client Management mode helps to install, configure, monitor and manage Office 365 clients. The Administration node is the SCCM console workplace where all the admin or server management configurations are performed. You could configure the SCCM server and cloud management options via UI from this place. The functionalities of following nodes are explained in the below section of this post. Management Insights node helps to Management Insights will help you to gain valuable insights into the current state of SCCM CB environment based on analysis of data in the site database. One of the scenarios the management insight would be useful is to understand your environment better and take action based on the insight. I have a post which talks about What is SCCM CB Management Insights. How to create package please share video as I want to learn package creation. I will also have a detailed video tutorial in future..